Uric acid occurs from high protein food. This acid is made of purine present in high protein foods. The normal level of uric acid in women should be 2.4-6.0 mg/dl and men 3.4-7.0 mg/dl. It is not so dangerous to be built. Usually it becomes more or less in every person and goes out through urine. This can be dangerous when it stops in the body and does not get out of the urine. In this situation, uric acid is stored in the body as crystals. High protein food such as beans, mutton increases uric acid in the body. The improper function of kidney increase uric acid in the body. The more fasting or dieting increase uric acid in the body. 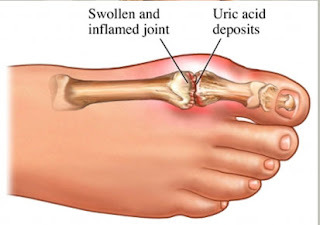 The high amount of uric acid creates many problems. Gout: Uric acid deposited in small crystal form in hands-legs joint. This creates stiffness and pain in joint pain. Kidney Stone: Uric acid crystal deposited in urine pipe and becomes kidney stone. This creates backache and blood in urine. Heart Disease: According to studies high uric acid creates high BP and heart diseases. Diabetes: Insulin level imbalance due to increase amount of uric acid in blood. This increases the risk of diabetes. Hypertension: American College of Rheumatology study, the increase amount of uric acid in blood increases high BP or hypertension. Water: Drink at least 3 liter water in a day and the more consumption of liquid diet removes toxins from the body. This also reduces uric acid level. High Fiber Food: The consumption of oatmeal, oats, beans, brown rice absorbs more amount of uric acid. Orange: Orange contains vitamin C, potassium, flavonoids and fibers. This is beneficial to remove uric acid through urine. Apple: Apple contains melic acid that neutralize the uric acid. This reduces the level of uric acid in the blood. Lemon: It contains citric acid and vitamin C, which is helpful to reduce uric acid in the body. Green Vegetables: Spinach and fenugreek reduces acid level in the body. It contains fibers, which is beneficial to reduce uric acid in the body. Anti-oxidants Rich Food: Red capsicum, tomato, broccoli and grapes have plenty of anti-oxidants. This reduces uric acid level. Apple Sider Vinegar: It increases PH level and reduces uric acid level. Cherry: It contains acanthocinus element, which neutralize the uric acid. This also avoids formation of uric acid crystal. Cauliflower: It contains vitamin C and K, which reduces uric acid.